The View’s Sherri Shepherd Opens Up About Her Divorce! Perseverance! 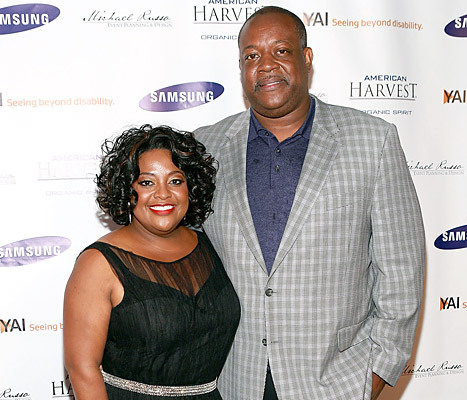 The View’s co-host Sherri Shepherd speaks to E News at the Samsung Hope for Children Gala in New York City on June 10 for the first time about her divorce filing with Lamar Sally. The two are engaged in a legal battle since early May. The nasty bout ensues cheating rumors and a custody battle for the estranged couple’s unborn child. Sherri says that she is in serious pain and she knows it’s something she has to go through to grow as a person. Lamar file for a legal separation on May 2, and also requested full custody of their unborn child, which is being carried by a surrogate. Sherri, responded by filing for a complete divorce. Sherri’s ex-husband, Jeff Tarpley, also filed for custody of their nine-year-old son, Jeffrey, on May 16, accusing Sherri of neglect and calling her a “terrible” mom. Looks like she is trying to raise him to be an upstanding guy despite the chaos in her life. This divorce seems like it will test anyone. Not only are you dealing with your estranged husband in a legal battle, but you also have to contend with your ex-husband too. Gees! Can’t the ex-husband take a chill pill? Let Sherri undertake herbattles of her existing troubled marriage without you putting your nose in it? Now I get it, emotions from a divorce take their toll on a person. As a woman/ mother you have to be strong for yourself and your sprouts. Sometimes you have break-downs during tough times. So when you are encountering heartbreak and a divorce, the parenting skills may not be up to snuff at all times compared when times were rosy. But everyone has bad days. It does not discount the wonderful mother you are 364 or 362 days of the year. So the ex-husband should sit down somewhere and let Sherri deal. Now, Lamar, you must have a legitimate reason to request custody of your unborn child. I hope it is genuine and not an ulterior motive to receive or get out of paying child support. However, despite your thoughts, I cannot imagine Sherri being an unfit mother. She is a career-minded woman like many other working single mothers out here. We manage and get it done! Sherri, tough times make you stronger. You said it best. Persevere! Better times are approaching! Previous PostSummer of Single!Next PostHappy Father’s Day To My Babies Daddy! You hit the nail on the head! Sometimes you have breakdowns during tough times. Everyone has bad days. My ex discounts the other days I am a good Mom. It seems he always calls when emotions are raw and the two younger teenagers are being “teenagers” dealing with puberty and a divorce. Then the blanket statement is made “You are a bad mother”. It stings! Yes…this is sooo true. I can recollect a few times my ex husband came by to pick up the kids and if their bags aren’t perfectly packed a house a tad disorganized from a long work week, or my daughter’s hair not perfect to his standards…. I get the same statement as well. “You Are A Bad Mother”. The issues we deal with. Enjoy your day! So glad to know I am not the only one. After he left, I still found myself running around making everything perfect if I knew he had to come by. Then I remembered; he is divorcing me, I don’t have to do this anymore. Enjoy your day.